In this fantasy series, a demon hunter tries to retire from his career, but he's drawn back in by the need to protect the daughter of one of his close friends. Turns out that the young woman has powers of her own and is a very useful demon-hunting colleague. John and Zed are back in New Orleans to investigate the case of a missing girl. Papa Midnite initiates the first steps in his plot for revenge on John. Meanwhile, the truth behind the Rising Darkness comes to light. John recruits Manny to go with him to a local hospital to investigate a mysterious attack. Meanwhile, a health scare leads Zed to question the source of her visions. Manny sends John to help an old friend, Ritchie Simpson, at Ivy University where a group of students discovered an alternate dimension with a maniacal killer. Constantine must defeat the evil that has descended on the people of Brooklyn when thousands of them slip into a mysterious coma, including Chas' daughter. An old flame sends John to battle an ancient evil goddess that brings him closer to the source of the Rising Darkness. John and Chas make their way to Mexico City and get closer to the source of The Rising Darkness. While in art class, Zed has a bizarre vision of snakes that lead her and John to a small town where a preacher is able to heal his congregation. In New Orleans, Constantine's unusual knowledge of a string of crimes gives him unwanted attention with Detective Jim Corrigan. Meanwhile, he makes an unholy alliance with Papa Midnite when a voodoo ritual to help people communicate with their dead loved ones turns deadly. When Constantine's old friend Gary Lester incidentally unleashes a powerful demon in Atlanta, John must decide what he is willing to sacrifice in his battle with the underworld. John and Zed confront an evil force to save a woman and her family. Deep in the mountains of Western Pennsylvania, John is the only hope for a small mining community's defense against an ancient Welsh spirit. In the event of protecting these isolated innocents, John aligns himself with a mysterious young woman named Zed. In the series premiere, Constantine, seasoned demon hunter and master of the occult, is thrust back into battling the worst hell has to offer in an effort to save the daughter of an old friend - and because there's a small chance of saving his own damned soul. Get a look at the new series Constantine coming to NBC Fridays this fall. It was a mini "LOST" reunion on the premiere of "Constantine." 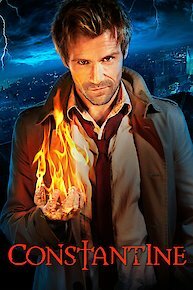 Constantine is currently available to watch free on CW Seed and stream on NBC. You can also stream, download, buy, rent Constantine on demand at Amazon, Vudu, DC Universe, FandangoNow, Google Play, iTunes online.